It’s almost here. On Wednesday night, Travel Channel’s “Food Wars” pits two Milwaukee restaurants’ cheeseburgers head-to-head. 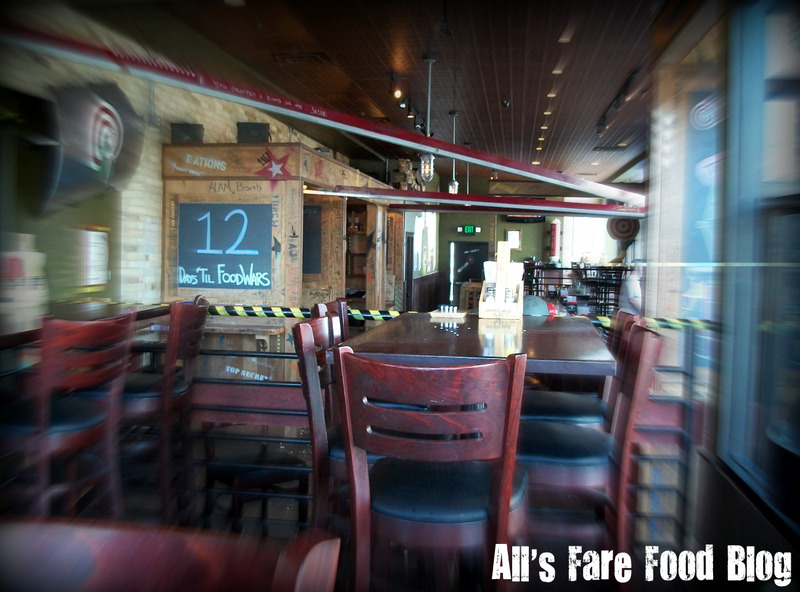 AJ Bombers and Sobelman’s Pub & Grill will be featured in the new episode that was filmed a few months ago. In anticipation of the show, I recently visited AJ Bombers for a taste of what they’re dishing out. 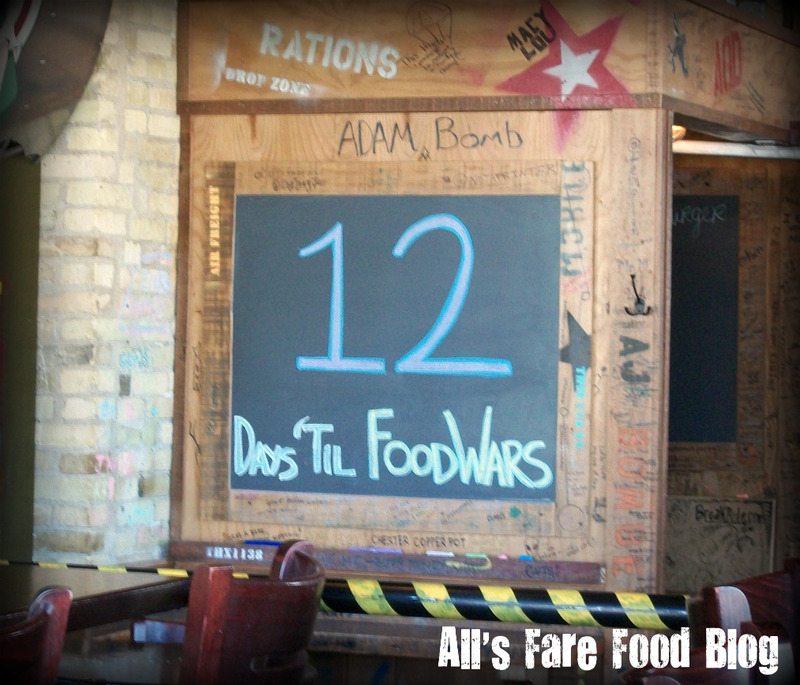 The countdown to the “Food Wars” challenge displays prominently in the front of the restaurant. It sounds weird but AJ Bombers’ Barrie Burger is a quarter-pound fresh beef patty cooked medium, and topped with American cheese, bacon and natural peanut butter. I was skeptical at first but the combination works well together. You get the saltiness and savory nature of the bacon and beef but then the not-too-sweet peanut butter cuts through for a nice finish. The peanut butter isn’t your run-of-the-mill Skippy or Jif, but a natural blend that has a nice gritty texture that stands up to the rest of the burgers’ ingredients. My dining companion – my dear brother John – enjoyed the Milwaukee Burger. This is the burger that AJ Bombers entered into the “Food Wars” competition. 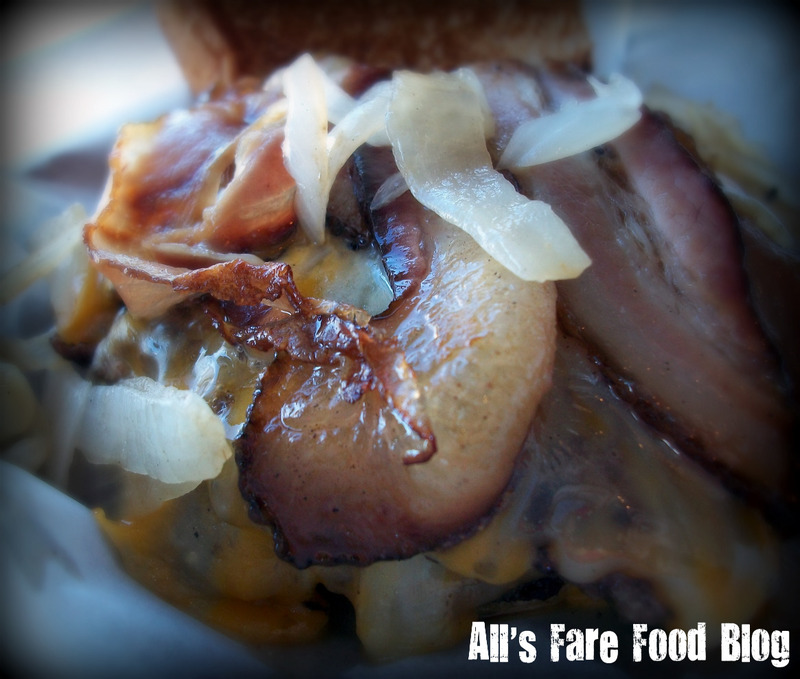 The burger patty is topped with Colby cheese, bacon and fried onions. Overall, a very solid burger. 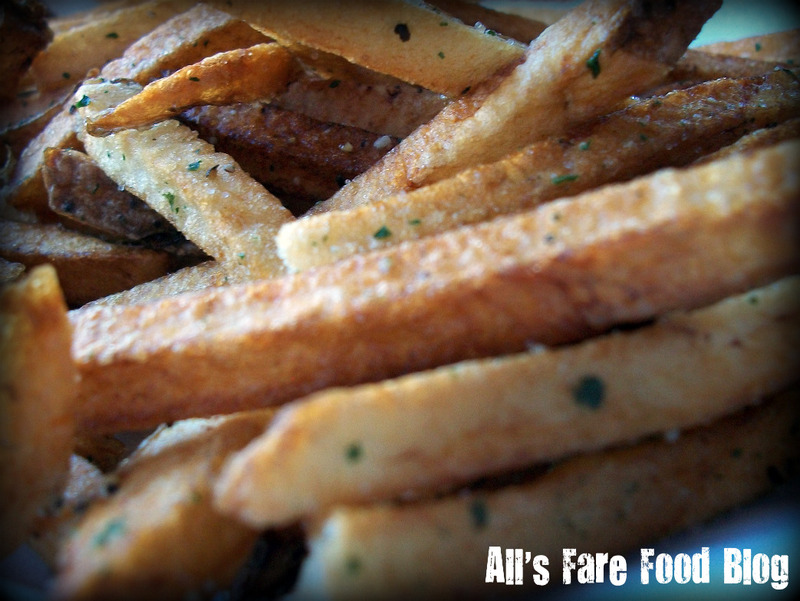 AJ Bombers’ fries are hand-cut and seasoned. I love when you can pick up a fry and one is crispy and one is still creamy. Each one is a trip to Flavor Town. A large order is $4 and is more than enough for two people. Bombers also offers sweet potato chips (which I enjoyed on a second trip.) Not like their Idaho potato cousin, the sweet potatoes are more like homemade potato chips – crispy, but not too much sweet potato flavor. Can’t get enough of AJ Bombers? Go home with some Bomber gear. T-shirts, hats, bags, mouse pads and even boxers and thongs are available through the Bomb Shop on Cafe Press. Everyone may not know your real name, but they sure know your Twitter handle. Leave your mark wherever you can find room (they’ll supply the Sharpie). 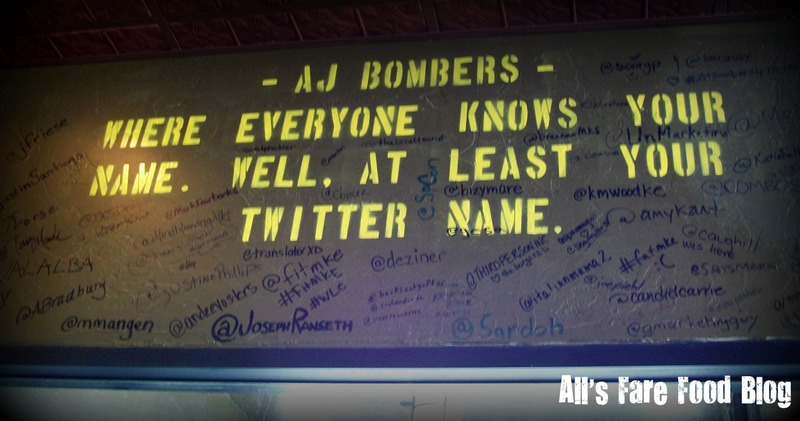 Haven’t followed AJ Bombers on Twitter yet? Find them @AJBombers. 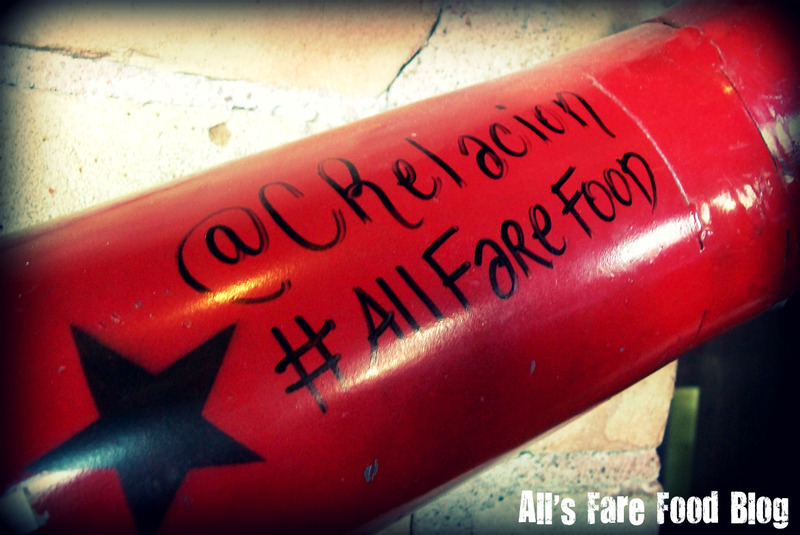 Owner Joe Sorge has done a great job of using social media sites to market his restaurant. He’s even been featured in some national media like the Wall Street Journal, The New York Times and CNN. Tweet or check-in on Foursquare about your trip to Bombers and you may be rewarded with a free pnut bomb or a cookie. If it’s your birthday during the week, the burger’s on them. 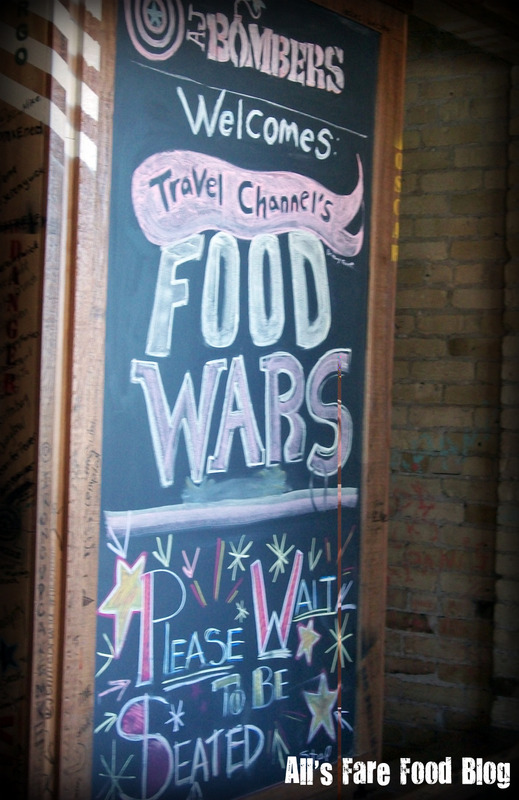 The “Food Wars” episode will appear on Travel Channel at 9 p.m. central (10 p.m. eastern) Wednesday, Oct. 13. Learn more at www.travelchannel.com. 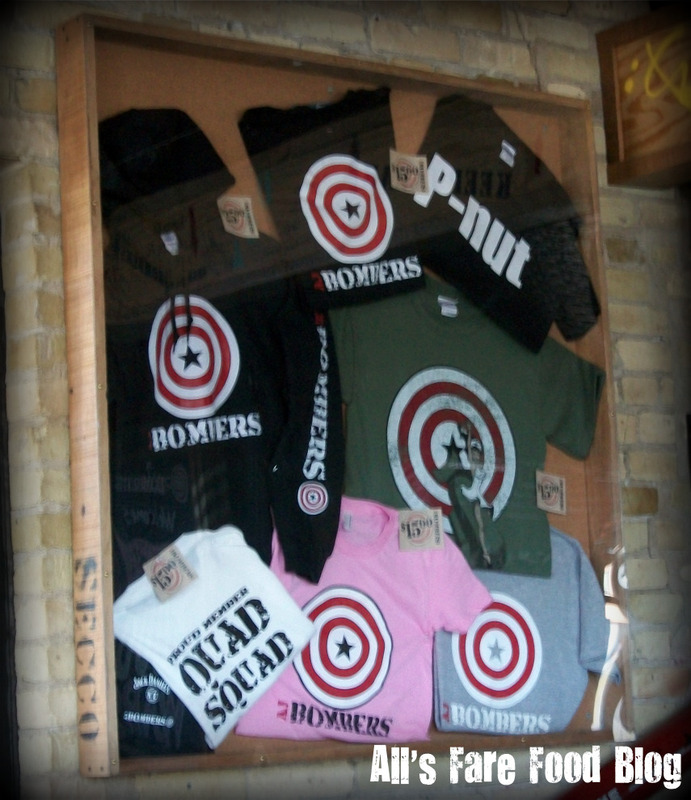 Visit AJ Bombers at 1247 N. Water St. in Milwaukee, or check them out online at www.ajbombers.com. 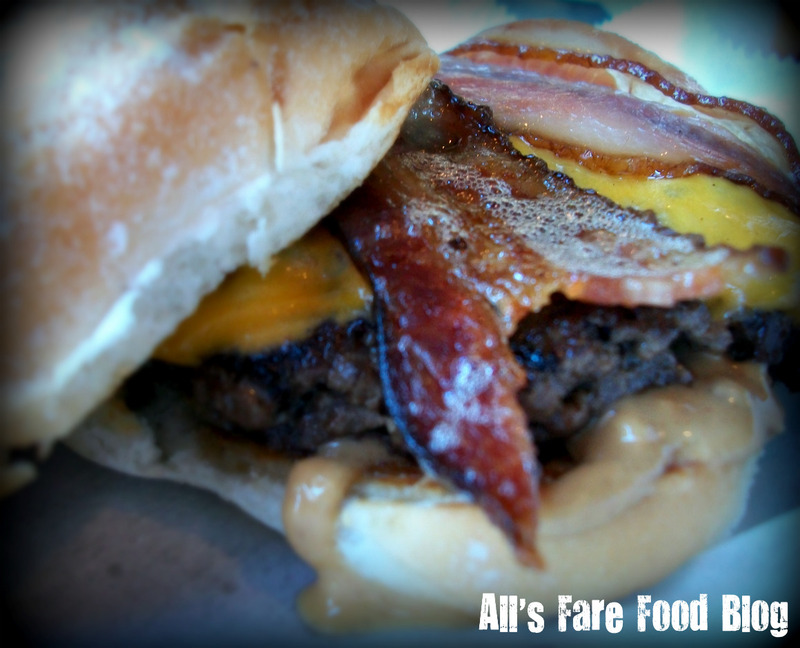 The perfect burger: All’s Fare Food weighs what makes the perfect burger to Milwaukeeans. This entry was posted in Cuisine - American, Food - General, Places - Milwaukee and tagged Adam Richman, AJ Bombers, Barrie Burger, Burgers, Cafe Press, cheese, Food Wars, Foursquare, fries, Man v. Food, Milwaukee, Milwaukee Burger, peanut butter, pnut bomb, Sobelman's, sweet potatoes, Travel Channel, Twitter by Christina. Bookmark the permalink. Awesome. I’m looking forward to the show. And the Barrie Burger is my favorite. The Barrie Burger is good. But I also really liked the turkey burger on cranberry focaccia. 100% agree with Christina…i thought i was the only one that thought the turkey burger was the best! The Barrie is very good too though…too many tough decisions…and the buffalo chix eggrolls…dang!